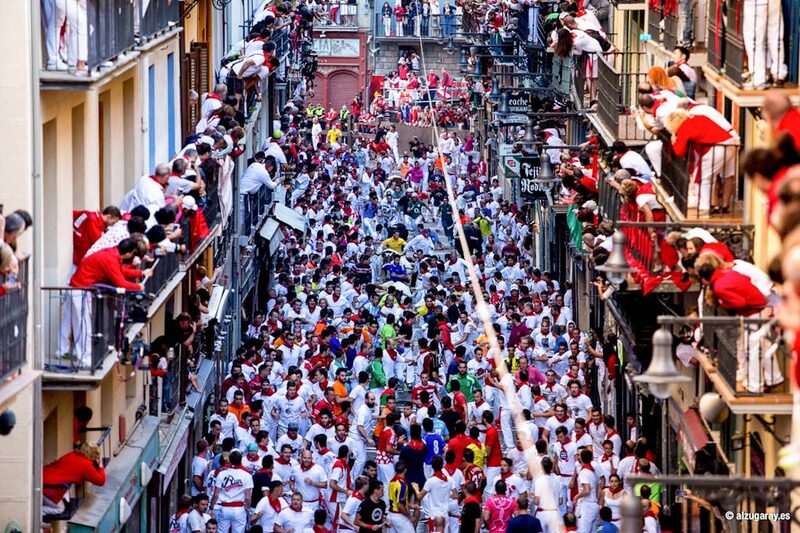 There are several options available to watch the Running of the Bulls but the most comfortable and impressive view is from one of the balconies that line the route. If you don’t have a good friend who might invite you to a free spot on his balcony, the best and safest thing you can do is to rent out a balcony. Some owners offer to let their balconies on the Sanfermin.com noticeboard, but in those cases, you are dealing directly with individual owners and you cannot be totally sure if it will comply with all your expectations. A safer bet is to go for a balcony with guarantees and this you can find at our online shop for booking balconies for the running of the bulls. (Tripadvisor Certificate of Execellence & 5 Stars Google Reviews) This is a reliable service which has been in existence for the past decade. The balcony is one of the best places to see the running of the bulls. You can feel the atmosphere of the runners below. The easiest thing is to watch the event on the TV and then when the bulls are about to appear under the balcony the people run out and watch it live. It is a very fast few moments but very intense at the same time. To accede to the balconies you must enter the stretch of the run early in the morning as the streets are then closed off to be cleaned up before the start of the run and access is cut off. Rent balconies to watch the running of the bulls 2018. The run can be watched from behind the wooden fence which lines the most part of the route. The longest stretch of fencing is at the Town Hall square, and at the end of Mercaderes Street, as well as all along the most part of Estafeta Street and the stretch which goes from the end of that street on into the bull ring. The fencing is double-lined and the spectators must remain behind the second line of fencing. The first line of fencing is kept clear for runners who need to make a quick exit from the path of the bulls. And in the spacing between the two rows of fencing only the medical teams, the police and perhaps some press photographers are allowed to stand. To find a good spot behind the fence means taking up position at about 6.30 in the morning. Inevitably, this means waiting round, bored to tears and out of sorts until eight o’clock when the run begins. There is no way you can “book a place in advance”. Anyone who wants to see the run must take up their position and hold it. And in the end the view is not so great as the fencing in front tends to block the view quite a bit. The locals don´t tend to watch from behind the fencing. One possible place, and somewhat better, is to go down to the starting post. There is a small sloping square just near where the local Museum is and which is looking over the starting place in Santo Domingo. 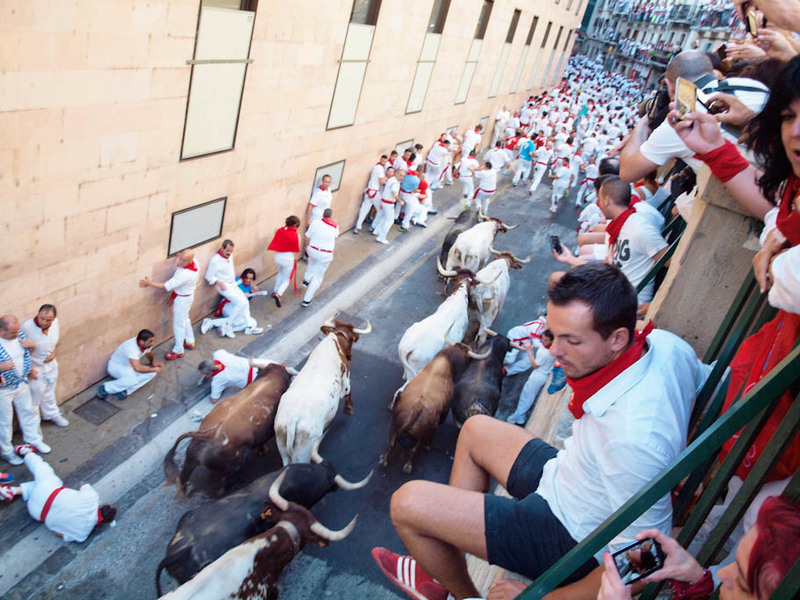 Here, there is no wooden fencing and you look down at the runners gathered round the nitch where they sing their simple paen to the small figure of San Fermin to implore his protection. The stretch which leads down to the pen from where the bulls will be released in just below and the view of the stretch leading up to the Town Hall is quite clear. It´s certainly one of the best spots and of course, for that reason is heavily populated. Get there about 5.30 or 6 o´clock at the latest, in order to get a good position. 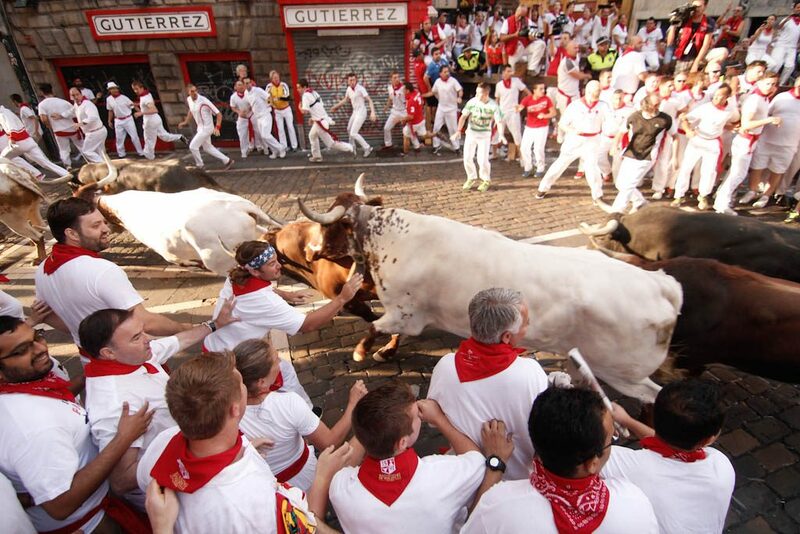 The running of the bulls finishes up in the bullring. In spite of the fact that it is the final stretch of the run, it is comfortable to watch because here there are some giant screens that show the complete run and then inside the bullring some young bullocks are let loose to be played with in the ring. 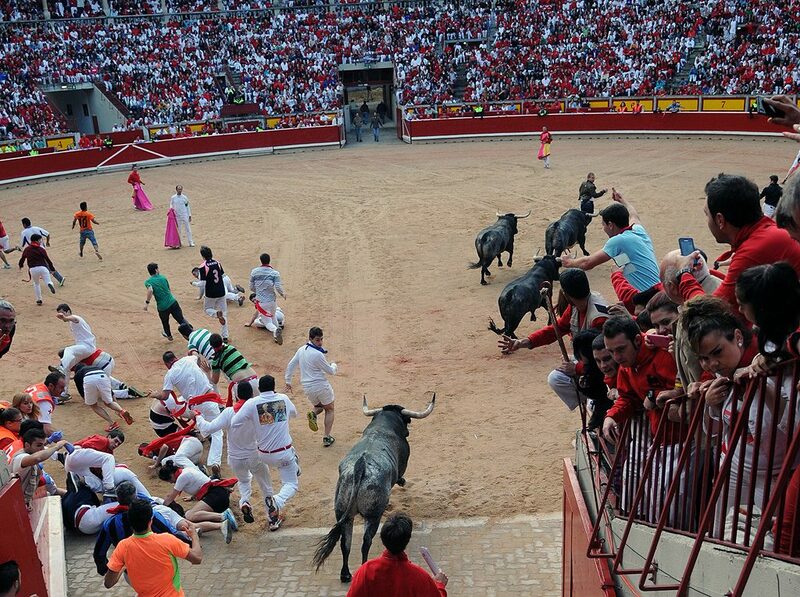 It is necessary to pay in order to see the finish of the running of the bulls inside the bullring. The tickets can be got through Internet or in the bullring. Before the running of the bulls starts a brass band makes the waiting a bit more enjoyable and you can also enjoy the spectacle of seeing many people who have up all night and who can be found in various stages of disarray. As a pure spectacle, the best place to watch the run is on the T.V. Strange but true. Among other reasons, simply because here you can watch the whole run from beginning to end. Moreover, on the T.V. they will repeat the most interesting parts in slow motion. RTVE broadcast the run directly each day and it will be shown on the state networks on the news broadcasts. Watching the event “live” means that you don´t get that complete coverage that the T.V. can provide. But of course, watching it live does have a colour and intensity which the T.V. can´t transmit. If you have participated in the run, then you might appear on the box and maybe you have the chance to record it on the video and bring it home to the folks! Remember that the one place that you can´t watch the run is from inside the course. You are in there just to run and nothing else. Bear in mind that the run is a very short spectacle. It will normally last only for a couple of minutes. As pure spectacle it is no great shakes. The excitement lies in its intensity, the potential risk, the atmosphere surrounding it, the shouts and cries, and the general sense of fear that those thundering bulls can instill in one.